I began training in 1989 at an evening class for martial arts. I went along because I had always enjoyed watching Kung Fu films. 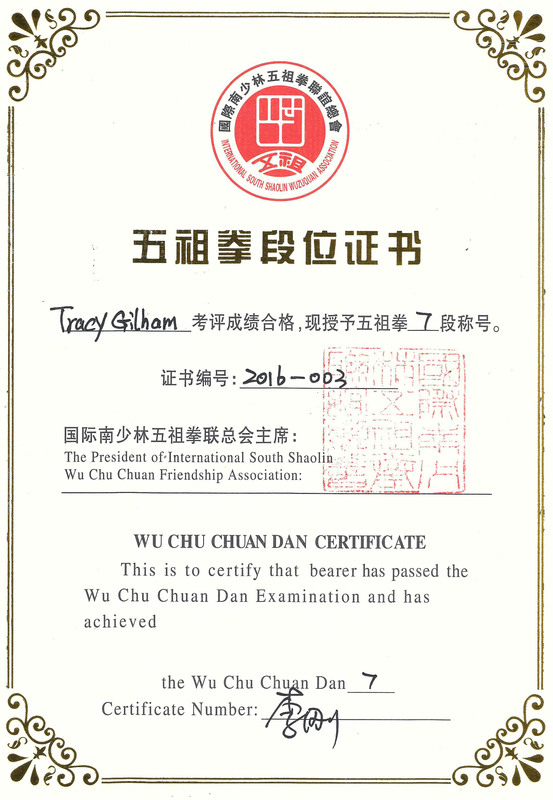 I started by learning Chang Chuen Shu and have managed to reach 4th Dan level. Wu Shu was added to my early training and I was fortunate to win many competitions in the Nan Quan and Nan Dao categories along with numerous semi-contact sparring gold medals. 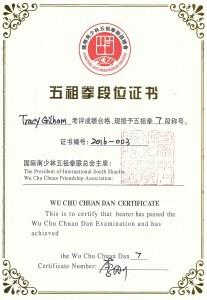 For a number of years I was the British Champion in a number of Chinese martial art events around the country. I have taken part in many competitions locally, nationally and internationally but the highlight of my competition career was in China 2006. I travelled there as part of the UK team under the Coach, Shigong Kim Han. I was very proud pleased to win three gold medals for the UK and be presented with a statue of ‘Dhamo’ in recognition of the FIVE Gold Medals my husband Nigel and I jointly won when we competed there. It has always been good travelling with the KIXX Martial Arts Teams to places like Ireland, Germany, Holland, Malaysia and China. The training has been good as I like tokeep fit but I also like the self-defence aspects. Despite my training I feel that I have so much to learn and will spend the rest of my life trying. I am currently attempting this task under the direct guidance of Shigong Han by learning the Wuzuquan / Wujiquan Styles of Southern Shaolin martial arts of China. I have also fulfilled an ambition by visiting and demonstrating my martial art at the Southern Shaolin Temple in Quanzhou, Southern China. In 2012 I was very pleased to be able to go to China and meet a number of the top masters from the Southern Shaolin in Quanzhou, Southern China. One of the highlights a personal tour of the Shaolin Temple and an amazing lunch with the Abbott. My interests include travelling, seeing new places, enjoying other countries and meeting people. Being involved and training at KIXX Martial Arts Club has helped me to realise this on a number of occasions.